For more information or to book your free place at this event, please email rj170@le.ac.uk. ​The relationship between mainstream psychology and the political sphere is changing. 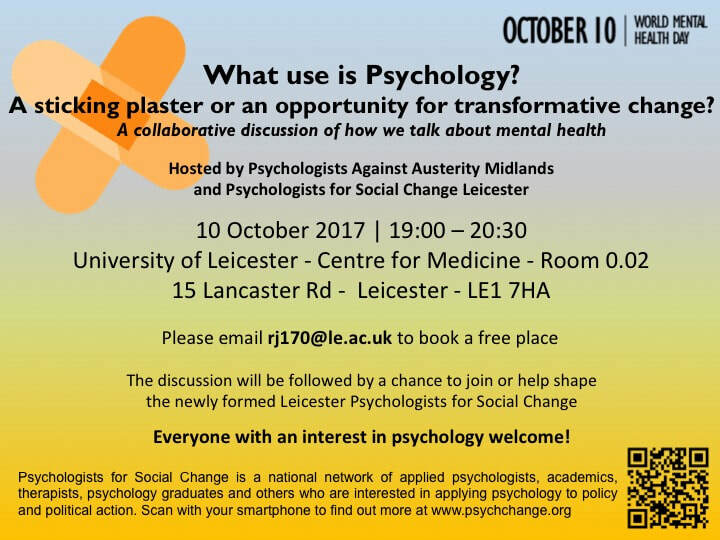 This talk will chart this evolving relationship by introducing Psychologists Against Austerity (PAA), a collective of applied psychologists and allies who see it as their responsibility to use the power, privileges and resources of their profession to actively engage in societal issues. Whilst community psychologists have long embraced engagement of this kind, PAA is the first UK collective from across the psychological spectrum – health, clinical, educational, forensic, academic and research – to embrace an activist-practitioner model. This talk will outline the founding and evolution of PAA and will present the accumulating evidence of the psychological impact of austerity as set-out in PAA's flagship briefing paper. There will be many opportunities to discuss both what psychologists have done as well as debate the general role of psychology within the fast-changing local and national political context. We will argue that despite decreasing rhetoric around the use of the term 'austerity' it nonetheless remains one of the most pressing psychological and political issues of the age. There is no need to book so please just turn up on the night.